Where an established orchard is converted to drip, the change in wetting pattern can ‘shock’ the tree and result in poor tree health and reduced productivity in the first year after conversion. However, converting existing trees can be successful if growers follow a few simple guidelines. Quickly encourage new root growth in the soil volume wetted by the drippers to support the tree during periods of peak water demand. Leach salts from the soil volume wetted by the drippers. 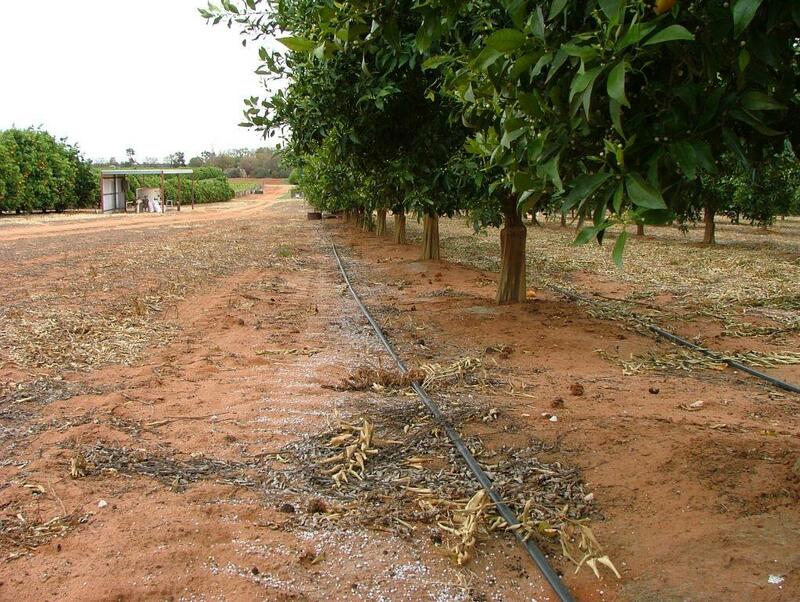 Full-cover irrigation systems tend to result in salt build-up beneath the tree row. To leach salts away from the tree row, the first few irrigations under drip should be reasonably heavy, taking into account crop water requirements, water tables and problem areas. Issues that might be encountered include those associated with the rootstock (some are more sensitive to conversion than others), soil compaction, nematodes and phytophthora. The success of the conversion can often be related to existing tree health. The conversion process can reveal some pre-existing problems that might have been tolerated or masked under sprinklers. The best period for conversion to drip irrigation is normally straight after harvest. Particularly for citrus varieties harvested in autumn, winter or early spring, as this gives the tree extra time to adapt to the new system before the onset of summer and without a crop to support. Ample water supply is usually recommended in the first year after conversion. Growers should not be too concerned about overwatering in the first year. A healthy orchard that successfully overcomes the conversion to drip irrigation has the opportunity to be efficiently drip-irrigated for many years to come. It is important to apply soluble fertiliser through the irrigation system (fertigate) early in the season to encourage root growth within the wetted strip. Applying sufficient levels of phosphorus and nitrogen will encourage roots to develop within the wetted strip. When fertigating, time the application over the whole irrigation period, allowing time to flush it from the irrigation system. It is highly recommended that soil moisture monitoring be adopted at the same time as the new drip system. This will help to identify the new irrigation management program required under the new system. It is very important that good soil moisture be constantly maintained in the smaller wetted volumes created by drip irrigation. Before conversion, carefully consider if conversion is appropriate for a particular patch. For some older patches growing on rootstock that does not readily adapt its root system to the wetted area of drip, or if Phytophthora problems exist, replanting might be a better option. Schedule irrigations more frequently and be guided by soil moisture monitoring devices. Apply a slight excess of irrigation to maximise lateral spread and leach accumulated salts. Adopt a regular fertigation program.